Violin Sonata no. 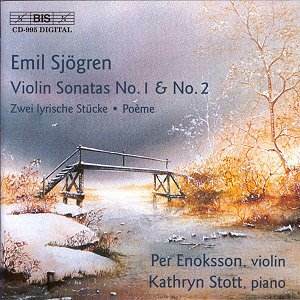 2 in E minor Op.24 ; Two Lyric Pieces; Poeme for violin and piano, Op 40 ; Violin Sonata no. 1 Op 19. This is a disc of charming violin music beautifully played and performed and a very pleasant surprise. It may not be great music but it is music of quality and worth. It is very well structured, logical and very attractive. Emil Sjogren was a Swedish composer, pianist and organist and , by all accounts, a particularly fine organist. He lived from 1853 to 1918 and his main compositions are for small forces. In 1883, the year of Wagner's death, he undertook a three and a half year journey around Europe via Copenhagen, Vienna, Munich and Paris. The French capital fascinated him and he returned there for holidays almost every year until the outbreak of the Great War. He met many famous musicians particularly violinists who willing played his sonatas. These included Thibaud, Ysaye and Georges Enescu. Another famous violinist, Emile Sauret premiered the first sonata in Stockholm in February 1886 with the pianist Felix Dryschock from Berlin. He too was a composer and I remember playing his Concert Piece for piano and orchestra while at College. The verdict on the Violin Sonata no. 1 made special reference to its freshness and that about sums it up.. Liszt played through the slow movement on one occasion and admitted its beauty. Again, Liszt was right. The Sonata no. 2 is far more ambitious and is in four movements. It has a relaxed flavour but it is not weak. It abounds in melody but is never banal. Even the drama of the piece is controlled. But the real revelation is how well these pieces are written for the instruments and this is enhanced by some super playing. I did not know the violinist but we all now Kathryn Stott who hails from the most beautiful county in England. We have enjoyed her concerto performances over many years but what an amazing accompanist she is. The fluency is remarkable from both players. The sonatas both succeed from having their respective movements belonging to each other both thematically and stylistically. But, for me, the Poeme is the gem. I had to play it three times in succession. It is the ideal slow movement, flawless, compelling with a magnificent ability both to communicate and impress. His music is a wonderful fusion of Northern simplicity and Gallic charm. I do recommend it. This is chamber music of a romantic character and, of its type, it is some of the best I have heard. And the performers have got it right! The balance, the passion, the commitment, the understanding, the communication... it is all here.